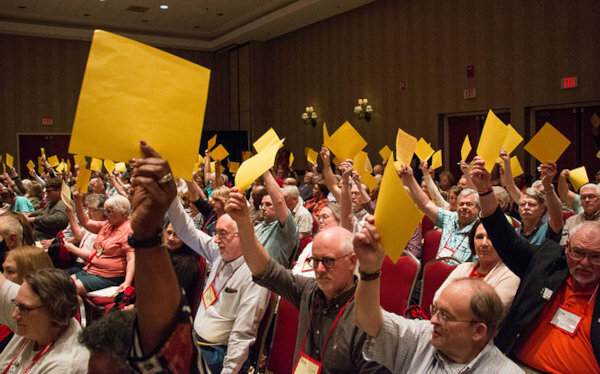 Raising yellow cards high in the air, the 2018 Annual Conference gets legislation done. ACME, MI (MIC) – The 2018 Michigan Annual Conference made history in several areas, including legislation. Thousands of votes had been taken at the previous 49 sessions of the Detroit and West Michigan annual conferences. But it was a new moment when yellow cards were held aloft in Governor’s Hall on Thursday. No more color coding … orange circles and blue squares … to denote conference membership. All members, one yellow square. It was a visual and actual signal that The Michigan Conference has become one. The 28 resolutions that were before the body for decision-making were, as typically the case, split evenly between matters that govern life together as a church and matters that govern the church’s engagement with the world. When the Conference agenda turned to legislation, it was an opportunity to act according to John Wesley’s Rules of Discipleship … ordering our conference, districts, local churches and relationships with the world in a spirit of compassion, justice, worship, and devotion. Eight resolutions generated lengthy discussion. All the motions eventually prevailed with the exception of one referral. R 1 Plan of Organization: concern was expressed and amendment offered about the structuring of district leadership and organization. Design Team Co-chair Marsha Woolley explained that the team’s intention was to leave “as much empowerment to the districts as possible,” giving flexibility honoring the unique context of each district. Confidence was expressed in the work of the Design Team. Amendments were defeated and the Plan was approved with minor editorial changes. R 13 Acknowledgement of Sin: Members took the scope of the resolution beyond the church setting by deleting the words “pastors and laypersons.” Approved the statement: “We acknowledge we have sinned in how we have sometimes treated those marginalized (people of color, Native American, women and LGBTQI).” A number of youth members were among those speaking in favor of confessing mistreatment of persons and extending blessing as Jesus did. Others expressed concern about disciplinary language. R 14 Call for Unity in Diversity: Delegate to the 2019 special called session of the General Conference Rev. 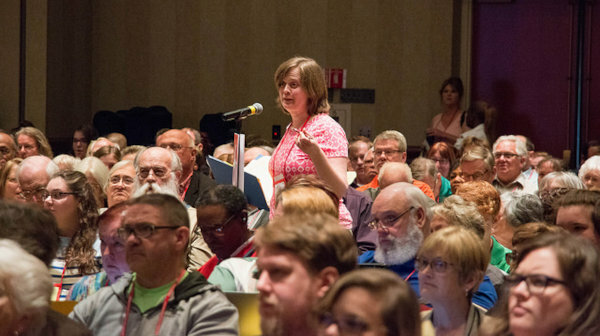 Melanie Carey, presented R 14 saying, “John Wesley argued that diversity provides opportunity for us to grow in holiness … This resolution gives us space for grace and to disagree agreeably …. And gives the opportunity to send that message to the General Conference in 2019. Think of what unites us.” A substitute motion urging the Michigan Conference’s adoption of the One Church Model, on behalf of Minnesota clergyman David Meredith, a married gay man, was defeated. The original resolution was passed overwhelmingly. R 16 Raise the Age in Michigan: The resolution, encourages Michigan UMs to contact legislators to support the bill that permits 17-year-olds to be considered juveniles in criminal court and to be held in juvenile facilities. Questions were raised around the risks to youth, the effects of abuse while incarcerated and the present practice of the state’s judges. The Resolution passed overwhelmingly as amended in committee. R 18 Childcare for Conferences: Debate began on Friday regarding provision of childcare at multi-charge conferences, and other mandated district and conference events. Questions about who would organize, who would pay, and assurance of safe childcare led to tabling on Friday and eventual referral to the Michigan Area Protection Policy Committee on Saturday. 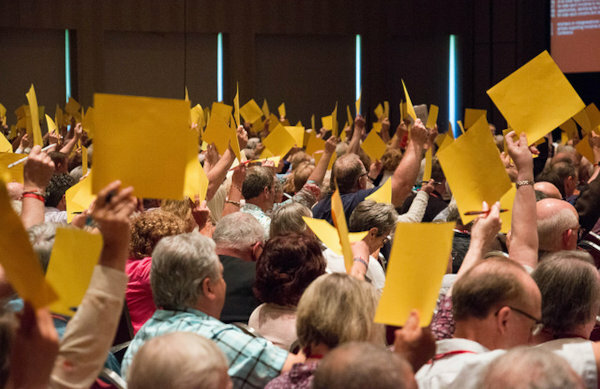 Constitutional Amendment #1: Bishop Bard explained to Conference members on Saturday that there had been an error in the wording of one of the Constitutional Amendments that were voted on across the global connection in 2017. This requires a new vote by all annual conferences of The United Methodist Church. The amendment proposed a new paragraph between current Paragraph 5 and Paragraph 6 of the Discipline focusing on gender justice. A written ballot was taken which will be submitted to the Council of Bishops. The recount will be announced after all 131 annual conferences have submitted their ballots. It takes a 2/3s vote in an annual conference to pass a Constitutional Amendment; then 2/3s of all annual conferences must approve in order to ratify. Stay tuned. R 2 Management of Benefit Claims; R 3 Housing/Rental Allowance for Retired Clergy or Clergy on Medical Leave; R 5 Past Service Rate; R 7 Michigan Conference Human Resources Policy #1; R 9 Policy on Use of Proceeds of Sale & Accumulated Assets of Local Church Properties; R 10 Clergy Family Statement added to 2017 Covenant of Clergy Sexual Ethics Policy; R 17 Breastfeeding Facility at Michigan Annual Conference; R17 Stop a War on North Korea; R 22 You Shall Not Bear False Witness; R 25 Protecting the Right to Peacefully Address Injustice through Boycotts, Divestments and Sanctions; R 26 Guidelines for Equitable Compensation Support; R 27 Minimum Base Compensation Support for 2019; R 28 is included in the Treasurer’s Report. R 4 2019 Comprehensive Benefit Funding Plan referred to the Board of Pension & Health Benefits; R 6 Amend Rules of Order Par. 5.1.2 referred to Rules Committee; R 8 Michigan Conference Human Resources Policy #2 referred to Human Resources Committee; R 11 Formation of Older Adult Ministries Council referred to the Board of Congregational Life; R 23 Child Incarceration, the Universal Declaration of Human Rights and UMW Priorities referred to Board of Justice; R24 Advocating for the Rights of Children Living Under Israeli Occupation referred to Board of Justice. Note: Resolution 19 (Questions for Candidates for Federal and State Offices) was not considered because the presenter was not in attendance at Legislative Committee. Click here to see the detailed Resolutions in the Legislation Book. Click here for the Consent Calendar and Legislative Committee Reports that include amendments in committee.